Ahmad Bilal New Bridal Wear Outfits 2013-14 for Ladies was launched recently. Long Shirts with Lehangas and Gharara, Frocks and Gowns with intricate work can be seen in Ahmad Bilal Bridal Wear Collection 2013-14 for women. Ahmad Bilal has designed this collection with full of heavily embroidery. 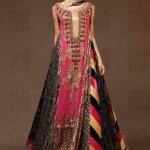 The embellishment of different type of embroidery has given an awesome look to all the dresses. You will find a nice mix of traditional designs in Ahmad Bilal Bridal Dresses 2013-14 which made the perfect fashion dresses for ladies and girls equally. Colors of the dresses are very attractive and best quality fabric has been used. Lets have a quick look at mesmerizing bridal dresses 2013-14 by Ahmad Bilal..
Ahmad Bilal is one of the most famous and well reputed fashion designer in our country. Ahmad Bilal started working in the field of fashion in 2005. This brand always launched latest and very trendy collection for all Women. Ahmed Bilal bridal dresses are always very uniquely embellished with beautiful embroidery and motifs. Ahmad Bilal expertise in bridal dresses, semi formal dresses and many other stitching patterns as well.